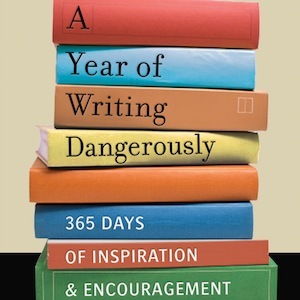 Excerpted from A Year of Writing Dangerously (New World Library, 2012). The date you begin writing, or start a new book, should be memorable, like a wedding date or a birthday. Sure you can suddenly fly to your computer exclaiming today you start your book, your essay! But preparing for the day, suddenly yearning for the day, making it important, building up energy for it – clearing your space, desk, table, or wherever you’re going to write, setting up objects or photographs you love and making it inviting might be a good way to begin. You’re courting the muse after all. Take time to get ready. Find books by writers you love, writers who inspire you. Figure out what time you’ll write. On your calendar put a slash through that time slot so you won’t inadvertently plan something else. In the end, wherever and whenever you work, make your writing time and your workspace sacred. You may find that your friends and family are somewhat less than respectful of you sitting there in your sacred space. They might even refer to what you’re up to as “typing” or “your new hobby.” Writing is not a hobby. Collecting stamps or coins are hobbies. Writing is a calling. Isabel Allende begins all her books on January 8th. She says that she writes the first sentence and then the story begins to unfold. One particular January 8th at the crack of dawn, her agent, Carmen Balcells, called her from Spain and told her to write a memoir. Allende replied that her family didn’t like to see itself exposed. As you write, you might want to keep this thought in mind: No one will read what you’re writing until you allow them to. So you are free to write the truth, or whatever you believe to be the truth. You can write dreadful and shocking things from your imagination, you can write badly and sloppily, you can whine and mewl if you want. Because: you can always rewrite, change things, or simply tear it up. Writing is rewriting. But first you need to have something on the page to rewrite. I asked a group of students once if writing felt dangerous to them. They all nodded vigorously, so I asked them to write why. Caught, found out, exposed. The stuff of nightmares. Is this why writing feels so scary sometimes? We’re caught like a fish on the hook of our own words, our secrets exposed, our inner life and imagination up for inspection. We are all scared of disappointing, of venturing past the safe boundaries of our minds and hearts – those of us still hiding in our caves and those of us whose job it is to help others. We all go around wearing masks. There’s no appropriate place, no safe place to jump off into your writing. In his writing classes, Roger Rosenblatt bursts into singing “Happy Birthday” out of nowhere, and his students stare at him as if he’s gone around the bend. He sings it again, and then tells them to start writing as they hear in their heads this “irritating, celebratory song you’ve heard all your lives.” Then he sings it yet again for them and they lean forward and begin to write. We’re so good with the negative voices: You idiot, what kind of an idea is that? Who do you think you are to be writing a book? Why are you sitting there in your bedroom slippers writing about your boring life? Who cares? When that voice starts chirping in your head and chipping away at your confidence, here’s what you do, listen to another voice, the sweet, calm voice that’s saying: Just do the work. Tell your story, it’s important. Have faith. If you’re sitting at Starbucks or at the library it’s probably best not to say this out loud, but if you’re home alone – say it loud. And often. When William Zinsser visited schools to discuss writing, he’d ask students, “What are your problems? What are your concerns?” and suggest that this would be the subject of their writing. But from grade school to college, most students would tell him that they didn’t have permission to write about themselves, the teachers gave them the subjects to write about. Established writers would tell him they had to write what editors wanted. If this has a familiar ring to any of you, or if you feel you need permission to write about yourself or whatever you need to write about, I give you permission. Now you have it. Use it. Barbara Abercrombie has published novels, children’s picture books, including the award­winning Charlie Anderson, and books of non­fiction. 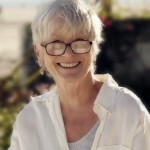 Her personal essays have appeared in national publications as well as in many anthologies. Her most recent books are Courage & Craft: Writing Your Life Into Story, Cherished: 21 Writers on Animals They’ve Loved & Lost, and A Year of Writing Dangerously, which was chosen by Poets & Writers Magazine as one of the best books for writers. New World Library has just published her fifteenth book, Kicking In The Wall. She’s received the Outstanding Instructor award and the Distinguished Instructor Award at UCLA Extension where she teaches creative writing. She also conducts private writing retreats and writes a weekly blog. She can be reached at www.barbaraabercrombie.com. She lives with her husband, Robert V. Adams, and their rescue dog, Nelson, in Santa Monica and Lake Arrowhead, California.